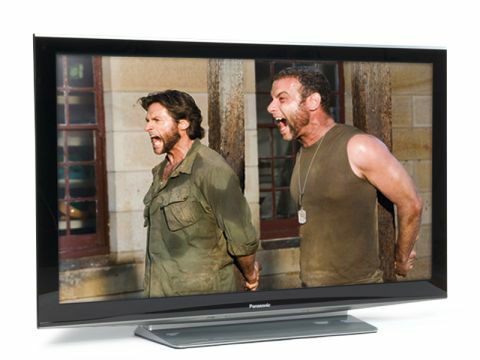 Replacing last year's PZ800s, the Panasonic TX-P65V10B is second only to the flagship Z1 screens in its TV range, and have been touted by some as the natural successors to Pioneer's Kuro sets. While the Panasonic TX-P46Z1 majors on fancy design, the TX-P65V10 offer the same display tech but with a rather more bread-and-butter design. There's no Wireless HD either, but screen sizes go up to this Greenpeace-baiting 65in version. As the largest set in the V10 range, the TX-P65V10B has much to live up to, but a cursory look at its spec indicates that all the stops have indeed been pulled out. It's bleeding-edge both in terms of display and functions, and if you have to worry about the price, then you're probably missing the point. The massive NeoPDP plasma panel is surrounded by a black bezel and topped by a silver control bar. The 'one sheet of glass' design does indeed make it impressive, but this is not an overly designed set; you would need to have a very large room or a sliding panel arrangement of some kind to be able to ignore this sizeable slab when it's switched off. The pedestal foot is a huge rectangle in brushed aluminium with a plasticised coating, and the back of the set is a sheet of aluminium which contributes to its considerable 53kg weight. There has been no attempt to make this set as slim as the Z1, though it's still quite svelte at around two inches thick; the part which protrudes furthest from the back is the connector for the Freesat plug. Otherwise, a familiar selection of connections is situated on the rear. A side-mounted SD card slot supports JPEG still images, AVI or DivX files up to 720 x 576 resolution, and AVCHD files. It'll be useful to owners of one of Panasonic's SD card-toting cameras or camcorders, though I'm not sure it's a substitute for the convenience of a USB socket. The panel is, of course, Full HD 1,920 x 1,080 resolution, and claims an 'Infinite Black' contrast ratio of over 2,000,000:1 in Dynamic mode, and a more down-to-earth 40,000:1 in native mode. Multimedia functions include access to websites through Viera Cast, still-image display using the Viera Image Viewer, and networking using the DLNA standard. The TX-650V10B has three tuners: analogue, digital and Freesat HD – Panasonic is still championing the upstart sat platform, but it remains to be seen what happens to the platform when rival Freeview HD launches in the coming months. Auto-tuning of Freesat, analogue and digital channels is blindingly fast and efficient. The OSD uses large, clear text and unfussy icons, while the Picture menu offers a selection of viewing modes. Each of either Normal, Cinema, Games and Dynamic mode uses its own preset levels for brightness, contrast and colour, and there's also a THX setting for movie-viewing, which calibrates the picture to THX-taste. You also get the standard contrast, colour, brightness and sharpness tweaks and a choice of Cool, Normal and Warm colour temp presets. However, for a prestige set such as this, picture tuning parameters just don't go far enough. There is no substitute for manual adjustment of individual RGB levels, despite the fact that the smaller Z1 has them. Other features include an Eco Mode, which reduces screen brightness and saves power, when you're viewing in a dimly-lit room, and a Multi Window function for picture-in-picture and split screen functions. The 'VIERA tools' button on the handset brings up access to still and video files from an SD card, control of compatible players via the TV's remote (this includes a 'Pause Live TV' function which works with Panasonic DIGA HDD recorders), and media server access via a network. Note that the DLNA network compatibility extends to still and video files, but not to music formats. Viera Cast, meanwhile, is Panasonic's way of giving you (limited) access to the internet. The sites supported at the moment are funny-cat video-fave YouTube, the Picassa photo sharing portal, EuroSport news, Bloomberg financial news and a weather channel. Not a terribly exciting selection, but I think it works faster and more efficiently than comparable systems from Samsung and Sony. You would be rightly miffed if you shelled out close to five grand on a TV and got a dog's dinner of a picture. Good news, then, that the Panasonic's performance is seriously impressive. Our Tech Labs measured its contrast ratio at over 68,000:1, comfortably outperforming last year's Pioneer Kuro screens in the pure numbers game. Okay, it's not the 2,000,000:1 claimed – but you have to take figures like this with an industrial lorry-load of salt. Despite the ratio, I didn't perceive the blacks to be the blackest ever; in a darkened room there wasn't quite that sense that the image is floating in space. This minor criticism is very much compensated for by a rich colour palette, which reproduces reds, in particular, with a fidelity rarely seen on plasma screens. Other highpoints include an impeccable rendering of greyscale, and dazzling levels of fine detail, and detail in shadows. Motion-handling is also first rate, although the Intelligent Frame creation (not available in THX or Game mode) and 24p Smooth Film mode options (to provide smoother playback depending on the framerate of the material) should be treated with respect. I managed to get Infestation (Blu-ray), looking like both a real movie and a cheap video, depending on the display mode selected. The TX-P65V10B's pseudo-surround sound system has three settings, V-Audio, V-Audio Surround and V-Audio Surround Pro. Though they do add a progressively greater sense of stereo space, they don't convey any real sense of surround – listen to the effect on speech, and you realise that the effect is actually a short delay. The V10's speakers themselves have a fair amount of oomph, though, and even some bass response. In essence, the TX-P65V10B offers the picture performance and networking abilities of the brand's highly-regarded Z1, on a much bigger scale, but lacking the arty design, Wireless HD and some of the user picture adjustments. Overall I'd be happy to trade these for the bigger screen size. Considering that there are few other comparable displays on the market right now (if any, actually), it's going to have the super-size flatscreen field pretty much to itself. But what a shame that Panasonic hasn't enabled the level of picture control that fans of a set of this calibre would surely expect.